Yuri Krinitsky was an 18 year old student when he came from Tashkent to study at the Russian Institute of the History of Art. Back home he had been involved in the setting up of several circles of anarcho-syndicalist youth. He was arrested there in autumn 1922 on the charge of publishing an underground magazine Turkestan Alarm and given a written denunciation. Undeterred by this he began anarchist work at the Institute, forming a group around him. During the Christmas holidays of 1923/24 he visited Moscow and received a membership card of Russian Federation of Anarchists, and several blank cards for distribution in Tashkent and Leningrad. In spring of 1924 he was elected chairman of the Political Education Departments of the Institute. During the summer holidays in 1924 he was arrested again in Tashkent, but soon released. He carried on activity at the Institute. In autumn of that year six Communist Youth arrived at the Institute and prepared a list for elections to the student bodies. At a mass meeting Krinitsky urged the students to vote against the list. The GPU (successor of the Cheka) had the Institute under surveillance. The Communist slate lost the election and on the night of 3-4th November the GPU arrested Krinitsky, Benjamin Rakov, Alexandra Kvachevskya, Panteleimon Skrinikov, Maria Krivtsova and Yevgeniya Olshevskaya. Krinitsky, Rakov and Kvachevskya were found guilty as socially dangerous elements that were corrupting the student body and exiled from Leningrad for 3 years. Charges were dropped against the others for lack of evidence. Krinitsky was deported for 3 years to Zyriansky, and Rakov and Kvachevskaya for two years to Kazakhstan. Rakov and Kvachevskaya refused to cooperate with the GPU and served a long exile. Kvachevskaya contracted TB and was released to her parents, breaking off all involvement in politics. Krinitsky resigned from the Russian Federation of Anarchists and publicly renounced his views in a newspaper, writing a detailed testimony on his activity to the OGPU (yet another new name for the Cheka). He testified that he had become involved in anarchist activity at the age of thirteen in 1919. He denounced dozens of students, saying that he now regarded himself as a Bolshevik-Leninist. He was released on October 15th 1926. Other anarchist students were now arrested. On March 13, 1925 Aida Issakhorovna Basevich was deported to Kazakhstan (awaiting rehabilitation in 1990 she told a researcher that the OGPU had orchestrated provocations with the distribution of Federation of Anarchists cards and organisation of anarchist cells). On June 19, 1925 Raisa Shulman was deported to Central Asia for 3 years for organising underground anarchist circles. She subsequently was imprisoned in the Verkhneuralsk political isolator. 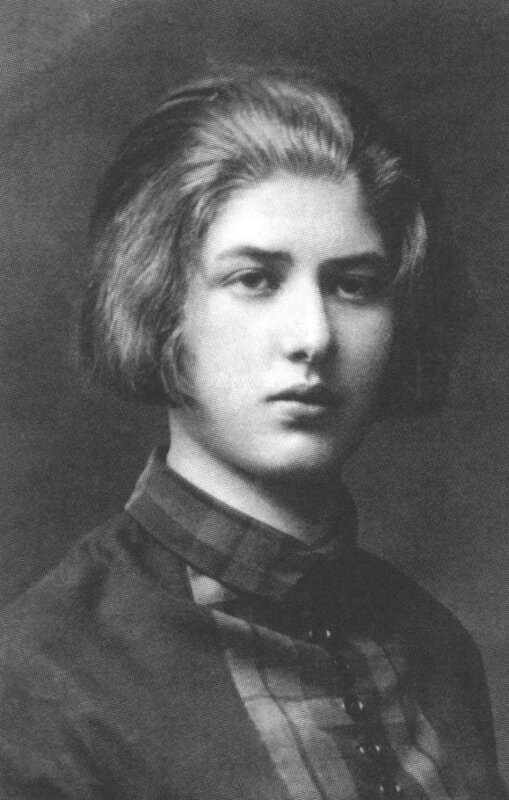 In spring of 1925 Lydia Korneievna Chukovskaya was arrested but was soon released thanks to the efforts of her father, a famous children’s writer with connections to the Communist leadership. She had not known Krinitsky and was not involved in underground work. In September 1925 the GPU began a new hunt for anarchists among the students. At this time underground activity at the Institute was being carried out by Ekaterina Boronina, a friend of Krinitsky, Bacevich and Shulman. She corresponded with Shulman and attempted to form an anarchist circle with Lydia Chukovskaya and Alexander Saakov, who had been a friend of Krinitsky in Tashkent. Students and workers met at each others’ flats, decided to establish an anarchist library, set up a magazine Black Alarm and a solidarity fund called the Black Cross after the well-known aid organisations for political prisoners. Black Alarm was modeled on the Turkestan Alarm, but only a few copies were printed by the student Kira Sturmer and by Boronina. Sturmer was a hardened anarchist. Whilst in Moscow as a student she had already been arrested by the Cheka on two occasions, in 1921 and 1923, for her anarchist activities. The magazine stated that it was opposed to all forms of capitalism, including the state capitalism that existed in the USSR, that discontent was growing every day and that the prisons were overflowing, with a growing new bourgeoisie from the party and state bureaucracies creating “aristocratic privileges” for themselves. Meanwhile unemployment was rising, encouraging crime, begging and prostitution. Meanwhile 50% of union membership fees went to the upkeep of the bureaucracy. The magazine referred to worker unrest and peasant uprising, remembering the Makhnovist movement and the Kronstadt uprising, and calling for the organisation of anarcho-syndicalist unions. Arrests quickly followed on the night of 26-27th July 1926. Chukovskaya and Boronina were among those arrested. Chukovskaya was 19 at the time. She steadfastly refused to rat on her comrades. Others indicted were Kira Sturmer, her brother Georgei, Saakov, Goloulnikov, Ivanova, Izdebsky, Budarin, Tamara Zimmerman, Fedor Mikhailov-Garin, Yuri Kochetov and several others. The connections between these anarchists seem tenuous, and the GPU were probably using the excuse of a conspiracy to round up anyone with anarchist sympathies. Mikhailov-Garin was an anarchist-communist, a blacksmith, who had been involved with the anarchist movement for a long time. He had been sentenced for 5 years in 1919 and was one of the prisoners released from the Taganka prison in 1921 and had then ceased political activity. Kira Sturmer and Goulnikov were sent to a concentration camp for 3 years; Boronina, Soloviev, Kochetov, Ivanova, Mikhailov-Garin, Izdebsky, Budarin and Golubev were exiled for three years, Georgei Sturmer was denied right of residence for three years, and Chukovskaya, Saakov, Zimmerman, Kokushkin and Volzhinsky were deprived of conditional right of residence for two years and were expelled from Leningrad. In late October 1926 Boronina and the bakery worker Boris Soloviev were sent to Tashkent and Saakov and Kochetov to Saratov followed by Chukovskaya in December. In Saratov there were many exiles with many anarchists among them. Among these was Dina Tsoyrif, who had already served time in Rostov on the Don. Dina was more experienced and older than those expelled from Leningrad. She was already 26, and in in 1918 and had fought in an anarchist unit during the civil war. She was born in Kiev. Her husband, also an anarchist, was serving time in Sverdlovsk. Chukovskaya’s father exercised his influence with important figures in the Communist regime and eventually obtained her release to Leningrad. The GPU continued their surveillance of Kochetov, Goulnikov, Kira Sturmer and Chukovskaya, and in Tver where Georgei Sturmer had been sent. By now he and Boronina and Chukovskaya professed to be moving away from anarchism. Boronina began working for the GPU and gathered information for it. In spring 1929 Dina Tsoyrif came to Leningrad and got a job as a statistician. Saakov and Rakov also returned as well as Aida Bacevich. Soon there were new arrests with Dina and her husband Nikolai Viktorov, Kochetov, Bacevich and several others being rounded up. Many were released for lack of evidence but Tsoyrif, Viktorov and Rakov were sent to a political isolator for three years, and Kochetov was exiled for three years in Central Asia. Again in 1935 Dina was exiled for 3 years in the Northern Territory and her husband for the same amount of time in the Kirov region, whilst Rakov was exiled to Kazakhstan. The worker Ilya Skorodiumov was released for lack of evidence in a case involving Dina in 1932 but in December 1939 he was sentenced to three years in the camps on the charges that for several years until the beginning of 1938 he had engaged in counter-revolutionary agitation and kept in touch with anarchists, speaking out against the Stakhanov movement and the material conditions of workers. Ilya died in 1941 while serving the sentence. In Leningrad in 1937-1938 Rima Nikolaev, Andrei Sparionapte and Julian Schutsky, survivors of the smashing of the anarchist-anthroposophical circles in Tashkent were shot, whilst Kira Sturmer and her husband Anton Shlyakovsky, along with Boris Shivobokov, were executed in Bashkiria on 13th November 1937. In 1946-1947 the security police began procedures for the arrest of Garin-Mikhailov, Saakov and Tamara Zimmerman. In 1953 the Bryansk KGB began to put together a case against Kochetov, based on what had happened back in 1926! During the war Boronina remained in Leningrad and buried her mother, who died of malnutrition. By the end of the war Boronina was a fairly well-known children's writer, She was awarded the medal For Defense of Leningrad and For Valiant Labour in the Great Patriotic War. But this did not exonerate her from being arrested on Oct. 30th 1950 on charges that she "in the past was the organizer and leader of one of the anarchist circles dissolved in 1926 in Leningrad, the anti-Soviet underground anarchist organization" and that she "did not abandon her earlier anarchist beliefs and over the years among her entourage expressed hostile attitudes to Soviet power, slandering the leader of the Soviet people and the policy of the Communist Party in the field of literature and art ". Boronina pleaded that she had been working for the secret police and denied the charges. She stated that under various aliases she had worked in Tashkent during exile, and then Leningrad until 1945. But in 1950, the investigators were more interested in denunciations of Boronina: that she expressed terrorist intentions. During a search books by Bakunin and Kropotkin were seized. Because Boronina had worked for the secret police her hearing was held behind closed doors. She was sentenced to 10 years imprisonment in a camp on February 17, 1951 and sent to Mordovia. In January 1954 she filed an application with the Central Committee with a request for rehabilitation. The condemnation was annulled on November 1, 1954 and she was released. Soon after, she died on May 29th 1955. The troubles that Chukovskaya had with the regime did not end with her distancing from anarchism. Her husband, the eminent physicist Matvei Petrovich Bronstein was shot on Feb. 18, 1938. She later became a noted writer, famous for her Sofia Petrovna which dealt with the Great Purges, and still had some of her rebellious spirit of her youth when she came to the defence of dissident writers. In 1969 the Culture Department of the Central Committee opposed the creation of a museum dedicated to her father because of the events of 1926. Chukovskaya was to remark that she was only peripherally involved with the anarchist movement and always maintained this position throughout her life. She did remark that workers involved in the round-up got far worse treatment than the students. On July 8, 1997 Chukovskaya was exonerated on all previous charges due to lack of evidence. She had already died on February 7, 1996. Yes it would have been!! !